Sometimes when we as Christians attempt to ask a question on one topic or another, a different question and thought process emerges from that thought process. This is surely true for this Series, as it has almost no bearing or resemblance to what it started out as initially. It all started with a preview of a documentary of sorts for a new movie which was created from a biblical story. The words located inside a verse which pose a question struck me during this thirty (30) plus minute review/ad, which is in II Peter 3 | KJV. 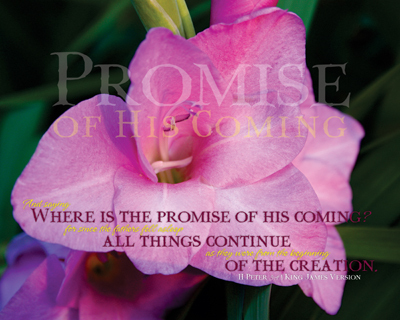 As we and the world look for that “Promise” to be fulfilled, we are reminded that all other events will continue for those things “of the creation” which the God the Father created individually and collectively. We might say that “life marches on” as we draw closer and move towards that next promised return Jesus Christ, the King of Kings, Lord of Lords. Nothing has stopped happening because it is coming, all is marching forward at the speed of life, to face that terrible day. Flooding my mind were questions that have been asked, especially in particularly tough circumstances and events, “Where is God…” when something bad happens. “Where is your Jesus…” now that this or that has been allowed to occur or take place. The statements, angry accusations and hurting cries come pouring from people in agony and wonder when bad things happen to otherwise good people. And what words they can speak, Bible they can quote and provoking thoughts they have in those situations, posing VERY probing questions which seem to have no answer in that moment of time and hurt. We as Christians have the Promise of His Coming, but have one item right now that allows us to walk through today into tomorrow – the Holy Spirit. That Peace is given us by the God of all Creation with our accepting Jesus as our Saviour, repenting of our sins and taking Him in as our Lord. That Promise, the Comforter, is inside of each Christian, which allows us to continue in Faith till He comes. These questions all have answers, we have to be willing to find them, not as a game of hid and seek, but rather as a matter of trust and obeying the Scriptures. We, of ourselves, are capable of little or nothing, so we would do well to ask ourselves the question and seek the answers from God’s Word. A portion of this understanding is presented to us in four, incredibly packed verses, which pose the question and explain to the early church how they could know then that the Promise was real and would come to pass in a future time period. We’ve each most likely heard this phrase, or something really close to it, just after opening our mouths to espouse something we’d just as soon forget than remember. Okay, I’ll be the first to admit it, more times that I’d like to admit – the alphabet order comes first, the SPEAK comes before THINK. There are literally thousands of things found where the phrase was used and the five questions (or something really close) were used in a print on varying kinds of materials. What amazed me though, is that very few of them had anything to do with Scripture whatsoever. Many of them utilized the question format when dealing with the topic of bullying and the actions taken by the bullied on themselves because of it. Next to ZERO had anything to do with how we should respond or speak about others from a Christian perspective. This set of thoughts had been gathered some time ago to put together for a Series from multiple sources. A friend who placed in on his wall had the tagline used for this Series, which was found in multiple places from multiple sources – so tracking it down to an original source has proven difficult. But that friend is not who this Series was built for – although Bro. Mike definitely will get a THANK YOU for placing it there to get the ball rolling. One of these individuals is a Brother in Christ whom I do not know personally, but know of and have gotten to know a whole bunch more about through folks at our church who do know him well. Events over the past two weeks have prompted me to get this one in the pipeline of design, with this particular man put squarely on my heart to focus upon. He will have to tell me the significance, because all I’ve got is the Holy Spirit convincing me to do. It does remind me very much of his writing of things on Social Media, but how exactly I’m not sure of yet. The second individual is a “more senior” Sister in Christ that I’ve grown to love, admire, trust, respect and plain flat out TEASE at every opportunity presented and tend to make some up just for good measure. The first image put together with the pillow of roses was specifically designed for her – while not her favorite color, it is her favorite kind of flower. She has reminded through struggle, sacrifice and counsel that it is definitely BEST to THINK before deciding to SPEAK what comes across the rear side of our eyeballs first, because what flies outside the front of our eyeballs can be too much, too late to take back once it is done. I already know the what and why because of the communication we keep going each week and sometimes daily. So you see that one person is seen from a distance, but has been put upon my heart to include, while the other person is so much more known and comfortable to design for and about. We do not always know what God has in store for the person who is receiving our focus being supplied solely of Christ – for the Brother in Christ is a Pastor. Even more important than that, is that we need not know the “why” in the situation, it is most important that we “do” for that person as the Holy Spirit directs, it could be JUST what that individual needs, delivered in a means that only they can or will understand. There are over 140 Series now for DeliverTheWord.com and not a single one of them has missed being delivered to the intended target, and each of them have amazing stories behind them as they are touched by them. Others have been impacted around the world by them – just as our words should be thought about before we speak them – we should have desire of the same type of impact, with the Love of the Father as our Guide. 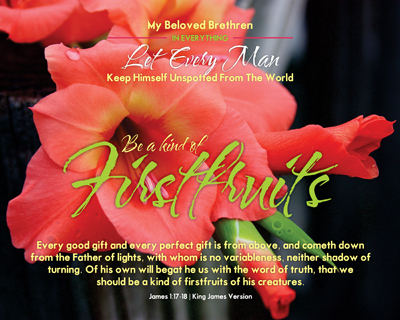 The five sentences asked in this Series, which are built upon the word THINK follow. 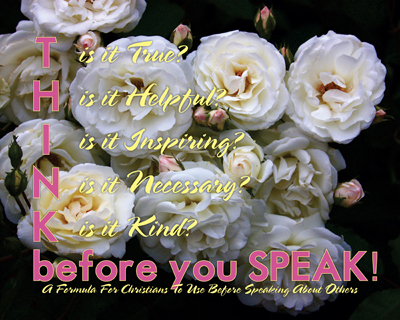 Will we “think” about these questions before we dare “speak” a word about another fellow Christian? How about we apply that to “any” other person? As Christians, we can use the formula to keep us out of trouble, and more importantly to not grieve the Holy Spirit. The focus for the four men there was the pattern of communication, which is turned all over upside down when we introduce our emotions into the equation. The verses say to be: swift to hear, slow to speak and slow to wrath. When we let our emotions get in the way, we have a tendency to do just the opposite: we don’t want to listen, we have the tendency to say whatever is on our mind, no matter who it might hurt and in doing so, we can let our passions get in the way of even basic reasoning and consideration of others. We can get out of order in a hurry and out of control just as quickly. Amazingly placed and very well built are the verses of Scripture that surround those two verses, which has become the focus of this Series. Our ability to be those kinds of listeners depends on our reliance on God the Father for the how to’s and following the example Jesus provides for us time an again in Scripture. Preparing this Series reminded me of how well placed Scripture can be a blessing to others even when they might not realize it. Some while back our family was out at an Italian eatery which we visit from time to time, inexpensive and we like the servers, where it was apparent that our server was having more than just a bad day. It began at the front door – he was thrilled to see us as we had not been there in several months. We are complete cut-ups when we go there, which the wait staff seem to appreciate as other patrons are apparently WAY too serious. He was more erratic than usual and was having difficulty keeping up, stating that the past week had been one disaster after another. Courtney noticed that he was uncomfortable, as we did, but put some shoes on that concern. We have the habit of writing notes on the receipts, some funny and some serious. This time – it was SERIOUS. A complete separate note was written to him, where Courtney asked if it was okay if she gave him my phone number. With a yes, that is fine, she finished writing, leaving the note under the edge of her plate with the tip. Later I discovered what she wrote and how important it was to him, because she listened and then recommended someone for him to talk to, who she knew would listen – her Dad. In my last conversation with him, he thanked me for listening and not judging him, along with his appreciation for me as a parent, taking the time with my child to listen. His challenges stemmed from a broken home, a broken marriage, a broken body and a broken spirit… In listening and a limited response, he knows Who loves him – God the Father and who will Save him if he trusts Him – Jesus Christ. The manner in which this Series is established and set up is to say the phrase “Let Every Man…” then follow it with the statement presented in the print. The nineteen (19) statements used in the prints are provided below. Have been delaying the development of this Series for a long time, matter of fact, a really, long, long time… The basis of it stems from two different peoples statements about life in general, which are interestingly enough tied to the Bible – both of these men based it as being so. Of course, there will be some push back, which is the reason for the delay – because we are in such a religious environment of folks saying “don’t worry about what everyone else says, you do what you are led to do”. Before all the defenses go up, understand that a lot of homework has gone into this one and the only reason it is even seeing the light of day is because of the Holy Spirit convicting me over it. Many GREAT people in the Bible got led to places and doing of things that were NOT pleasing to the LORD their God. Most often we are only going to get a single opportunity (vs a chance, rather they are Divine appointments, not happen chance) to be the witness that we need to be to folks we are completely unaware are watching. We most likely will never know the impact we make on others when we don’t understand that we may be their only, or last even, hope at that moment to have the miracle of being a Christian placed before them. Somewhere along the line we each may have heard something like “we may be the only Jesus they every see”, that is the concept attempting to be conveyed here. Take a look at the color of the letters from that verse… Our Lord and Saviour Jesus Christ was speaking those words and He is the one I’m pointing your toward in the convincing of Who is watching. Those others, any person on this earth that would look upon us, should see clearly – not perfectly, for we are yet sinners in this body of flesh – that we are One of His, a sheep listening to the Master Shepherd – the Lord. They may not understand the “Who”, but I’ve got enough experience to know that complete strangers, who are not Christians and readily profess they have no faith whatsoever, can tell a Child of the King from even a group that is not. 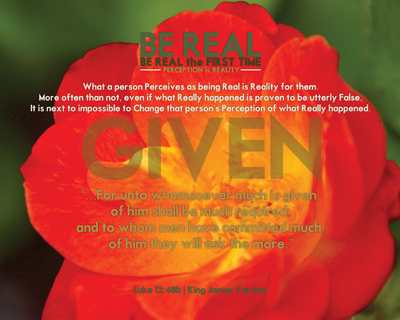 What a person Perceives as being Real is Reality for them. It is next to impossible to Change that person’s Perception of what Really happened. Now, of course, we cannot go around attempting to fix every person’s view of what we’ve done, said, not done and not said – that is NOT what is being talked about here. Our motives for doing things need to be constantly evaluated as to be in alignment with God’s Will for our lives and our seeking through Him to do all that He wants us to do for Him and ourselves. We have to evaluate how what we do will be taken by others who will see us day-in and day-out and make sure that we are not becoming a stumbling block to others, even if what we are doing is not sinful or against any kind of rule or law. I Peter 2 | KJV addresses this clearly. Our conversations MUST be honest as Matthew Henry points out in his commentary on the chapter. But one MUST also take into account I Corinthians 8 | KJV, as the final verse gives us clearly a defining consideration for ANY individual, no matter of position or placement. My Grandpa Turner was a man of VERY few words, but honor was a core principle of his – if you said you were going to do something, he expected you to keep it, by whatever means was necessary. Three chapters in the Bible share with us that charge and principle, Romans 12 and Romans 13, interestingly enough notice they follow each other – then we should consider I Peter 2. Only the direct verses have been listed here, but they can be found in this Series under the Study tab. Really, to get the full grip of the context, the entire chapters need to be applied to this topic. This concept of “honour” is one of making a declaration, a promise to carry something out or complete said agreed upon item not just merely because it was said, but because all parties agreed to it in good faith and made of those involved their reputation by declaring it so as the Lord gives it to be. For many Christians that are personally known, they generally have in the top five (5) things in life they want to be remembered by the item of “being real”. What they might not realize through, is that the Lord God and our Saviour see us as we really are, always. Added to that, a lost and dying world is by FAR more discerning than we have given them credit for being – for we have something they want, if we will JUST be honest about it. It is how others come about saying “you seem so calm”, “I don’t know how you are handling all this stuff that is going wrong” and my personal favorite “You must be a Christian because…” with a listing as to what quality they have see portrayed out in front of them. We sometimes miss the factor that the Holy Spirit is not just working in our lives, but also in the lives of others around us, without either of the people realizing that working is being constantly organized and culminated so we can ONLY attribute it to Divine Intervention, not anything on our own parts. We very much have not only the responsibility but also the duty to make certain that what others see of us is Honoring our Creator God, our Lord Jesus Christ and points to our Holy Script, the Bible. Yes – what people do with things that they “think” they are seeing being done, or have perceived someone of saying or actions that are not being taken for whatever reason, is not something we can chase down – but our EFFORT should be placed in bringing Honour to our Creator, not skepticism and reproach. When we fail to properly represent Him, we are doing just that – bringing reproach upon our God, Our Saviour, Our Salvation. Included in this list are the fourteen words used in this Series considered in the development. Being Real the First Time will cause SO many of those issues to be kept at bay, allowing us to be the positive Christian witness in all areas of our lives that we are supposed to be! This specific set has been carved out of an overall message, which will be developed into a Series also – but for now, we will focus on this specific ten (10) part set. It is by no means exhaustive, nor does it cover all of those things we should have in our lives as Christians, but a good start for us to consider and build upon! Many times, during a message, a small phrase will trigger something in my heart and mind, which is typically written down with the time in the message – just in case something is missed so it can be gone back to be re-listened to as soon as the service has been loaded to our church website. The use of modern technology, even in the simplest form, can make a large impact on how we put in our lives those things God the Father has for us to learn. This is one of those “small phrases” which caused me to go back to see how the verses of Scripture created the Ingredients list. While they are in no specific order, they all address something that Dr. Ingram specifically drove home in that particular revival message – the “sin of disbelief” which is reflected in the second Scripture reference and Ingredient choice: Believe. So they may appear sporadic, which is understandable, but they are actually in order by the message our Revivalist preached, not alphabetically. The following Ingredients list includes those things we must have, in order to both begin and continue in our Christian Life the way the God of Creation would have us to through His Son, the Lovely Lord Jesus Christ… the Saviour of all Creation. 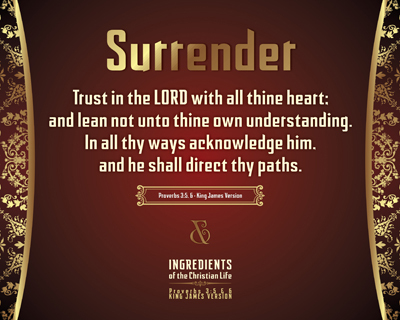 From the beginning of Surrender, trusting God for all, to being that Servant, being the Lord’s, will we determine to have others see those Ingredients of the Christian Life, so that when they look upon our lives it is evident we living the Christian Life? If not, this is a good starting point. Otherwise, each of us should check this list from time to time, making sure we have these, as well as others, set before us as a reminder of what we should be for the Lord! Of course, it is realized that #2 and #5 are the same question by way of words, but they were presented at VERY different times during his discourse. The “running dialogue” is shared on the Series page of this Series. 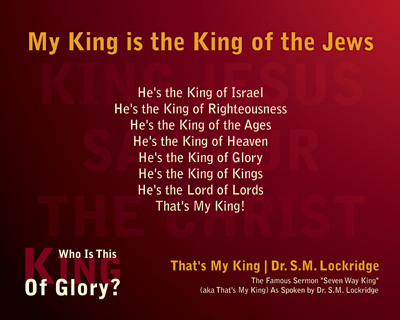 He was VERY plain in his presentation of his King and had a VERY convicting placement for all five of his questions, along with the Declaration of Who His King IS! That’s My King, That’s My King, That’s My King!!! Wonder If You Know Him Today? Well… Do You Know Him? If we would present the Gospel of Jesus Christ in a manner that others could and would see this King in and through our lives, the world would be a DIFFERENT place! Well, let’s get STARTED – tag, YOU are IT! Through all of this struggle and difficult time, I’ve reassured, shared and tried to make sure to point ONLY to the Lord and the arms of the Comforter we have given us as Christians of the Holy Spirit. Words offered at just the right time – all promptings – to get UP and GO right then to keep from missing the opportunity given. A couple were phone calls at odd times, others were texts that were directed as clear as anything that can be recalled and a few just stopping what was being done and being available to listen – all surrounded by the Word of God in my office. Incredibly – each was delivered at the time exactly as God had intended – which still makes my knees weak and me tremble a bit at the working of it all – He did it, I just listened. Interestingly enough, as this is being typed a consideration comes to mind – I do NOT have to run to READ His Word, my office is completely wrapped up in it. At work, my office is filled with artwork created from nearly 140 Series worth of items created for DeliverTheWord.com – some are complete sets, while others are single pieces chosen from the particular Series being represented. The rules for my office in a secular workplace are two fold – the door remains open and when you enter into my office, Spiritual matters are a two way street. It has dawned on me, of course, that years ago when the first pieces were hung up, that it would be very evident who occupied the office as folks would be entering as they arrive there. A very purposed action was put into my workplace which remains now some fourteen (14) years later, as has been evidenced by the many folks who have come to see what has been added and share here and there about what is going on with them – which turns into prayer requests and concerns being shared. 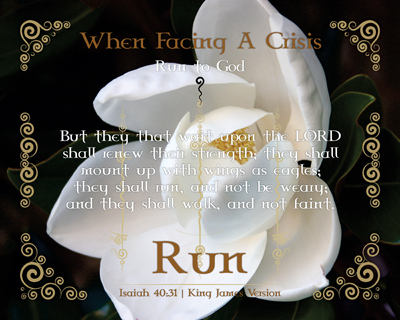 The question comes in this form though – do, or rather, will others think of coming to you when they have a crisis arise in their lives because they KNOW you KNOW the God of all Creation? If so, will you ALWAYS point them to HIM? Long ago something was learned about pointing to myself – remove the I’s in everything possible – because when you introduce “I” in the equation it only spells “trouble”, which of course it is realized doesn’t have an “I” in it. When a crisis arises, our natural tendency as human beings is turn to ourselves or to run to a “person” who may have a perceived “answer” to the challenge. But we have to keep in mind that the first place we should turn is to God the Father, it doesn’t matter where we find ourselves! Others will be able to tell Who our Crisis Management Team are – seeking our Saviour, accepting the Holy Spirit’s Comfort and our turning to God’s Word for His Direction. This Series contains ten (10) directives that can be directly tied to Scripture for what can be done when a Crisis strikes in our lives or in the lives of others that we have the opportunity to be a witness. We are promised and guided in these ten (10) things about what can be done when a crisis strikes in our lives, no matter the size, direction it comes in or how it may arrive – He is ALWAYS God and there for each of us!